These photos highlight the growing characteristics of both cucumber and zucchini. Cucumber plants vine upward with strong stalks and massive leaves. The flowers produce cucumbers underneath them. Very similar is the zucchini plant, which doesn't vine, but also has strong stalks and massive leaves. They too begin growing underneath the flower as well. Zucchini plants are really neat to watch as they grow and produce. Both male and female flowers grow on the same plant, and the male flowers fertilize the female flower, usually through insect pollination. It can also be done by hand with a Q-tip. You can see that the flower eventually falls off of the zucchini before harvesting. 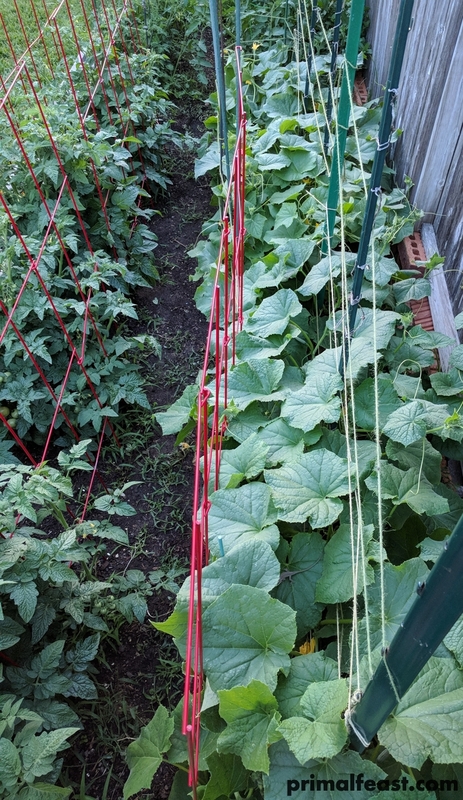 Photos of vining cucumbers, two tomato plants, hot pepper plants, and a large zucchini plant.